Psychosocial assessment is a significant part of any nursing assessment with a lot of perfection. It helps largely to inform and detail a care plus management plan to a great extent. In the present scenario, People often are present with more than a set of surgical or medical issues plus social or psychological factors may directly or indirectly affect their compliance or recovery with treatment in a successful manner. It is to be remembered that Assessment Forms play a vital role in the Psychosocial Assessment related process. This particular Psychosocial Assessment comes with a certain set of Close-ended questions that need to be answered in the form of Yes or No. 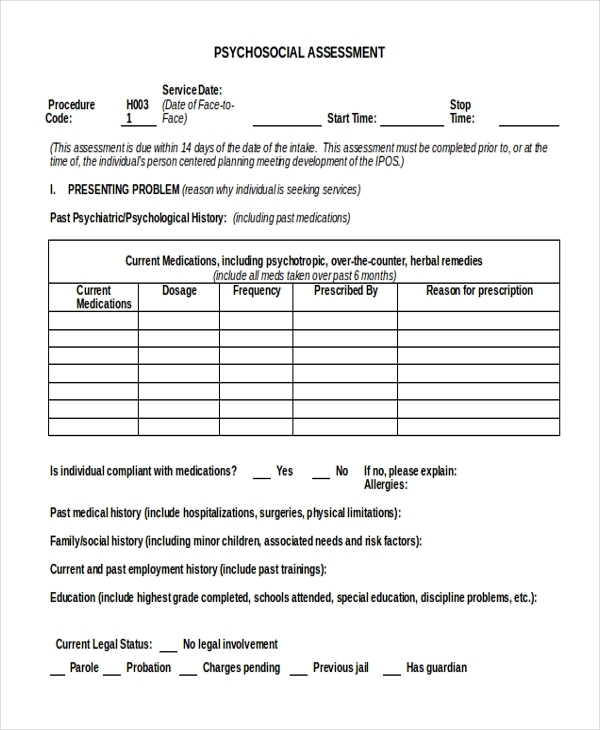 There are spaces to fill in details and information related to past psychiatric/psychological history, drug/alcohol assessment, mental status assessment and summary/assessment of mental status exam. 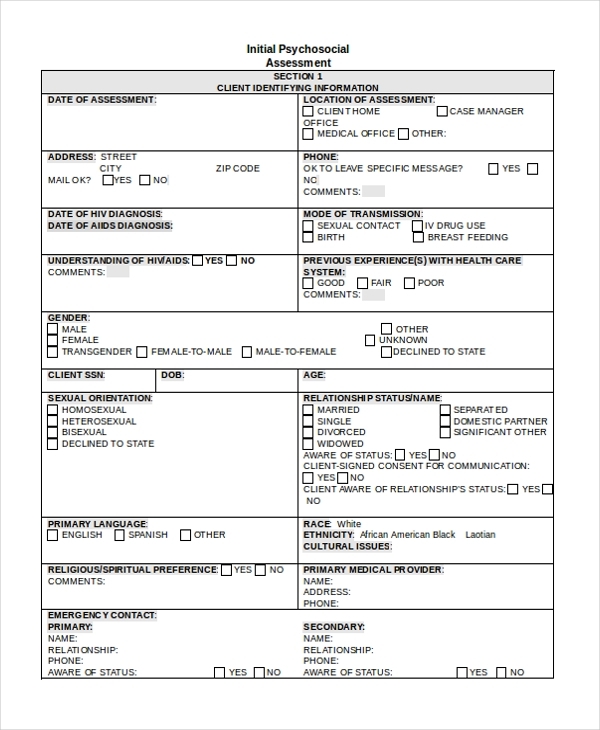 You may also see Physical Assessment Forms. 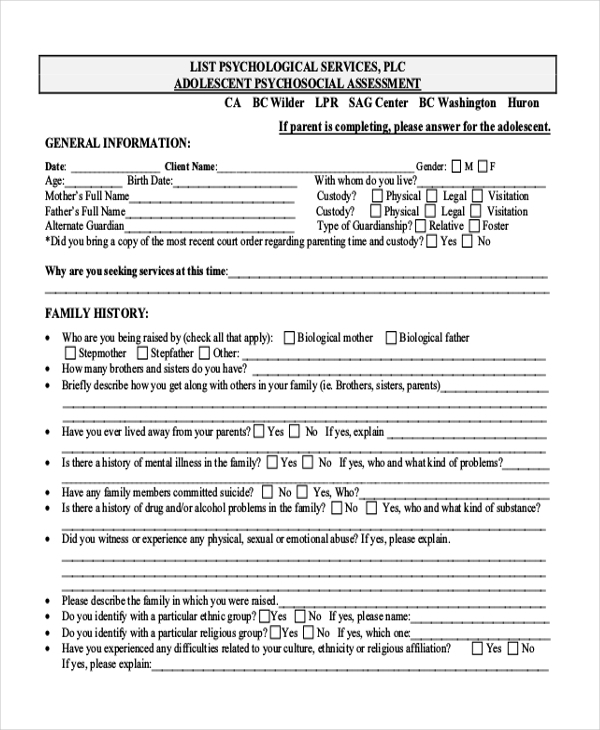 This unique Psychosocial Assessment comes with space to fill details and information related to triage family history, relationships, abuse history, spiritual & cultural issues, educational status & history, financial at entry, employment status & history, living arrangements, legal status & history, etc. 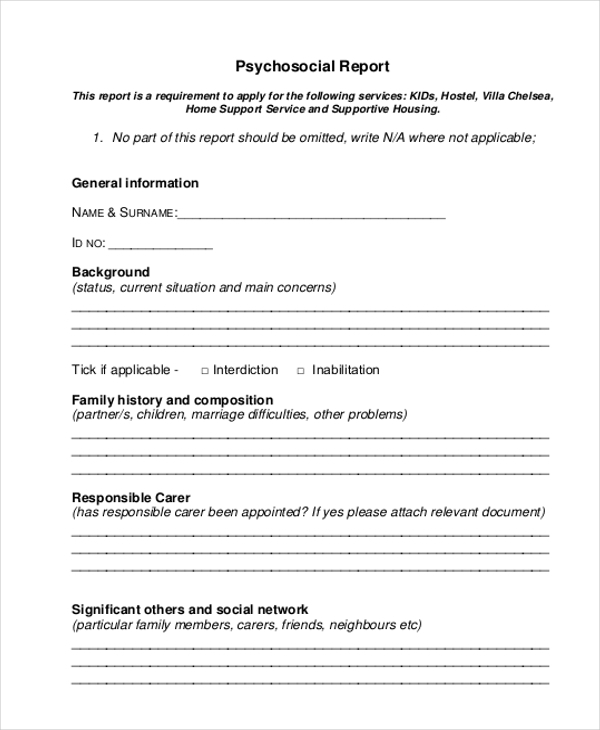 This special Psychosocial Assessment comes with sufficient space to fill confidential details and information, summary & conclusions, a summary of current care needs, signatures, etc. this particular form uses right kind of templates, patterns and enough space for jolting down things related to the form. You can also see Health Risk Assessment Forms. 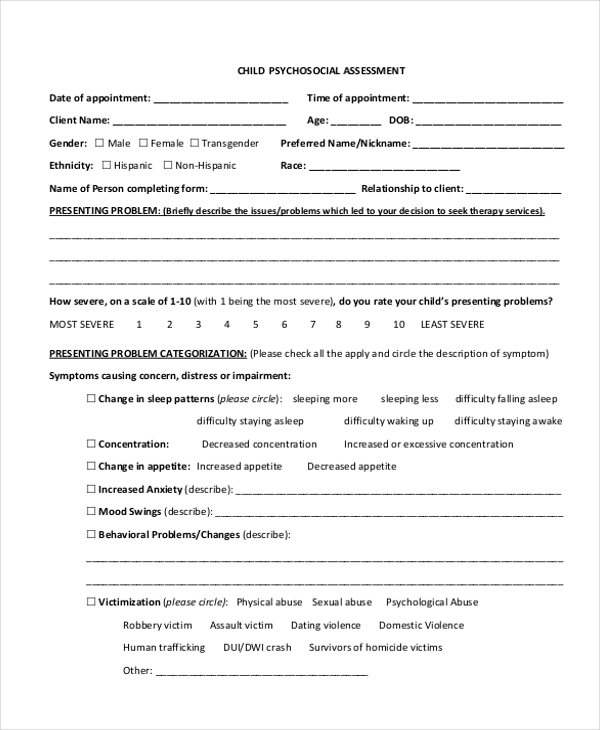 This particular Psychosocial Assessment comes with column for client identifying information, legal information, risk assessment and mitigation , social status, mental health/emotional status, current mental status examination (MSE), current mental status examination (MSE), substance use/abuse information, risk factors for HIV transmission, food/housing/transportation, practical support, financial assessment, summary/conclusions, etc. This particular Psychosocial Assessment comes with sufficient space for Psychosocial Report, General information, Conclusion, Civil or criminal proceedings, Other medical conditions, Current treatment, Present psychiatric conditions, Psychiatric History, Involvement of other services and professionals. You can also see Insurance Assessment Forms. 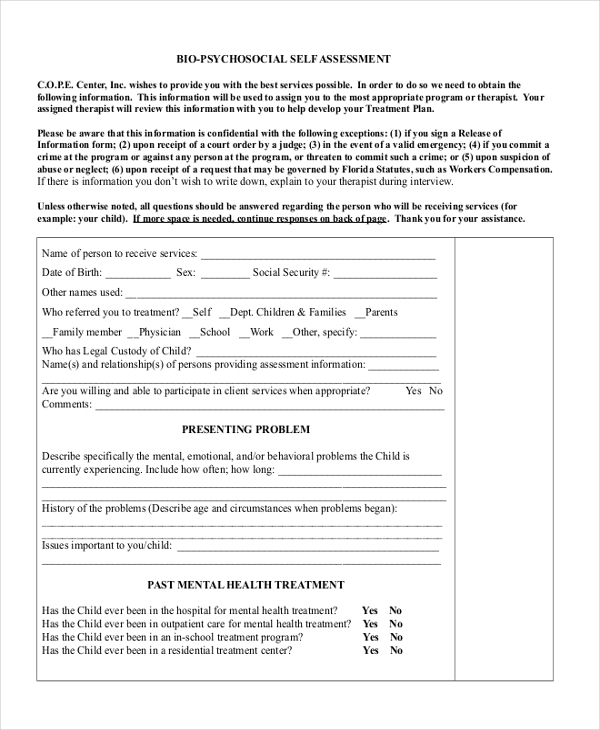 This Psychosocial Assessment form comes with space for writing down current needs/goals, child/adolescent psychosocial assessment, strengths/resources/supports, history of abuse/neglect, parent/child relationship, history of violence, legal involvement, family mental health history, alcohol/drug assessment, foster care involvement, etc. Why Use Psychosocial Assessment Example? This particular Psychosocial Assessment comes with space to fill information and details related to relationships, triage family history, abuse history, educational status & history, spiritual & cultural issues, financial at entry, living arrangements, employment status & history, legal status & history, etc. The example related Psychosocial Assessment gives a better idea of how the form looks like in many aspects. You may also see Nursing Assessment Forms. What is a Sample Psychosocial Assessment Report? This particular Psychosocial Assessment comes with enough space for General information, Psychosocial Report, Civil or criminal proceedings, other medical conditions, Psychiatric History, Current treatment, Present psychiatric conditions, Involvement of other services and professionals, Conclusion. 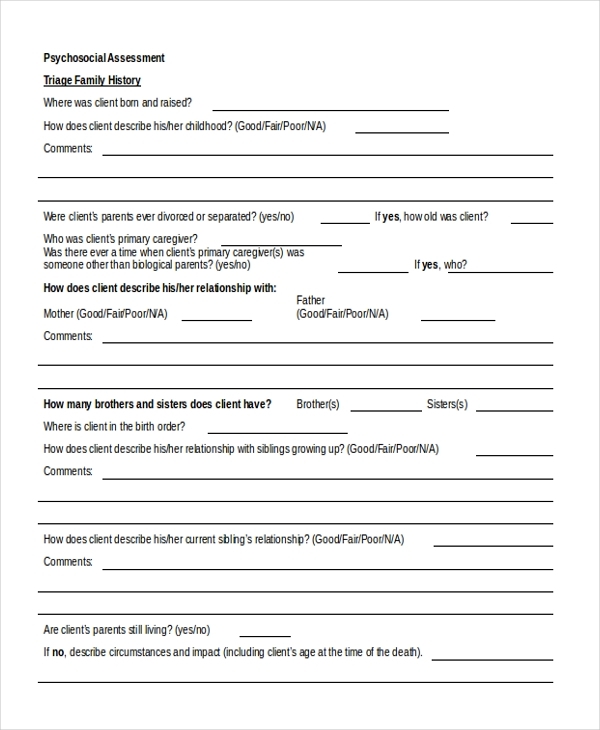 You can also see Self-Assessment Forms. In the open market, Nursing Assessment Forms is an instant hit. Psychosocial assessment forms play a significant role in the medical field. These forms come with apt templates, format, statements, space for details and information, etc. 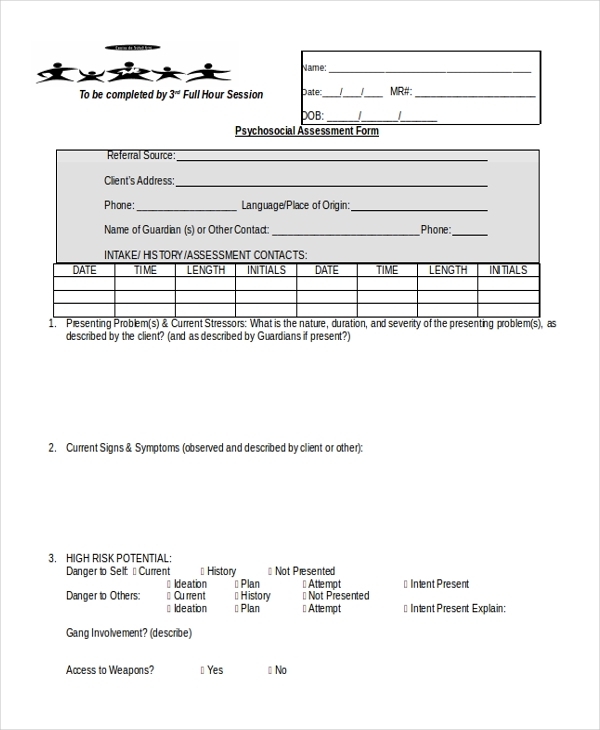 These forms have space for concerned authorized signature.